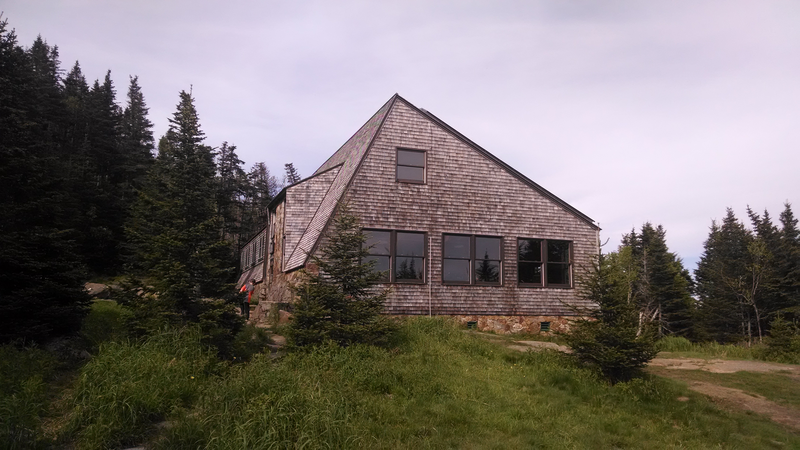 Lakes of the Clouds is one of the AMC's most beautiful New Hampshire trail lodges. After a weekend exploring the Appalachian Trail from our base at the AMC Highland Center, we began to appreciate how this pioneering environmental organization brought New Hampshire’s great outdoors into our lives. Run by volunteers, The Appalachian Mountain Club (AMC) serves nature on a platter to people of all ages and athletic abilities through its well maintained trails and housing. One the AMC’s six lodges, the Highland Center at Crawford Notch was built on the site of the turn-of-the-century Crawford House, whose patrons took advantage of the nearby rail lines to get away from the brutal air and summer heat of cities choking on the industrial revolution. The Crawford brothers wined, dined and provided healthful walks for their affluent patrons, who used the surrounding forest for hiking, fishing and camping out. Guests from the resort and nearby B&Bs would ascend the Crawford Trail across the road, many en route to the summit of Mt. Washington, more than 8 miles away. Today’s AMC Highland Center at Crawford Notch meets the same needs for travelers, albeit as a non-profit venture dedicated to education and environmental stewardship. Lodge accommodations are simple, clean and comfortable, with eco-friendly low-flow toilets, faucets, and showerheads, down comforters, comfy leather chairs, and carpeting made from recycled plastics. Rooms range in size from double with a queen bed and private bath to family rooms with a queen and two bunk beds down to dorm style rooms with a shared bath. It’s rewarding to know that the lodge furnishings were donated by the New England outdoors legend L.L. Bean. AMC staff are exceedingly helpful and knowledgeable, with an especially sincere love of the outdoors that is infectious. The entire crew, many of whom are college kids with summer jobs or internships in environmental programs, are very engaged with younger guests. 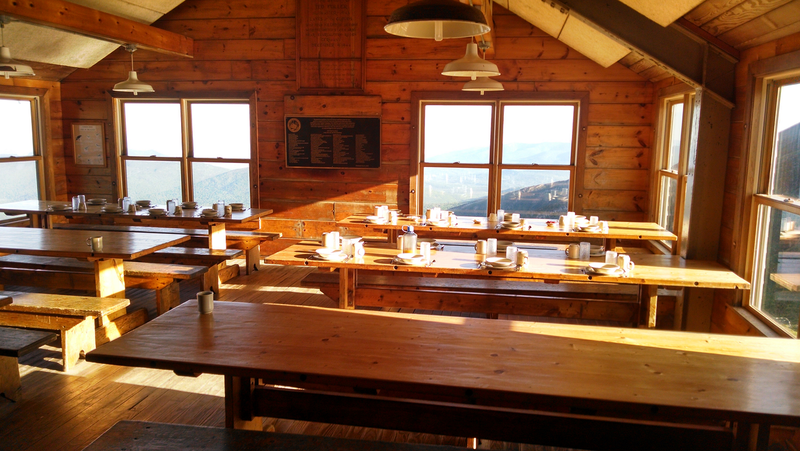 At dinner time, they come around to each table and advise guests about the next day’s weather, offer tips on potential hikes, and promote the evening programs. The wild nightlife ranges from talks by a visiting naturalist to a movie about an outdoors topic, or stargazing. Some will opt for the nightly moose spotting missions that take guests out to look (from safely inside a van) for the majestic beasts, who are quite common in the area. Every weekend throughout the year (some themed to family harvest, senior fitness or the holidays) offers special day activities in cross country skiing, digital photography, orienteering, family outdoor adventures, alpine wildflowers, bird watching, “leave no trace” environmental programs and others, all free of charge. Kids ages 5-12 can complete a workbook with staff help and become certified Junior Naturalists any time. Highlands Lodge has several excellent hikes available right outside the door. Young children and family members who are less capable hikers will appreciate two of them. The Ammonoosuc Lake Trail begins at the back door of the lodge and leads around a beautiful lake, just a 1.2 miles walk, with the slightly more challenging Red Bench side trail leading to, yes, a legendary red bench with a panoramic view of the Presidential Range across the way. A hike around Saco Lake is less than half a mile and less satisfying because of the adjacent highway, but it begins across the road from the lodge. Families can watch fly fishermen practicing their art while admiring the bird life circling the shore. As moderately fit babyboomers, we enjoyed the three-hour hike to the top of Mt. Willard. Although it was raining (the dense forest canopy protects rainy day hikers ), and there were somewhat foggy views from the summit, it was a wonderful way to spend the afternoon. The distance covered is 3.2 miles and the rise in elevation is 900 feet. It was a good introductory challenge but a real pleasure. Feeling weary but fit and maybe a little cocky, the next day we tackled Mt Pierce, one of the treasured “4000 Footers” of the White Mountains, a club of peaks that includes the Presidential Range, the King of which is Mt. Washington, weighing in at 6288 feet. The ascent of Mt. Pierce primarily follows the Crawford Trail, the oldest continuously maintained trail in this country. The roundtrip hike varies between four and six hours, depending on whether you pause at Mizpah (we did), whether or not you linger to enjoy the views of Mt. Eisenhower, Mt. Monroe, Mt. Washington and other peaks in the Presidential Range from the summit of Mt. Pierce (we did) and whether or not you pause to soak your weary feet at the roaring Gibbs Waterfall (we did). The more serious hikers will stay over at Mizpah Hut (requires reservations for the multi-bedded bunk rooms and meals) and continue northeast to bag the Presidential sequence of Eisenhower, Franklin, Monroe and, the big guy, Washington. 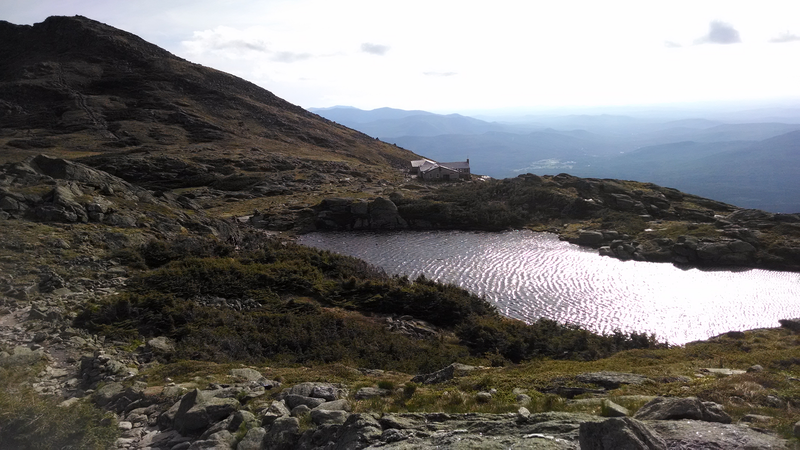 The Lake of the Clouds Hut makes a good second night stopover, with Mt. Washington greeting you on day three. The AMC Lodges have small shops selling mountaineering equipment and a loaner program with some gear donated by L.L. Bean. My husband really appreciated the support given by his Leki trekking poles. Like ski poles, they provide stability, balance and support for bad knee joints, and they became popular hiking buddies. The Appalachian Mountain Club – Highland Center at Crawford Notch (603/278-4453) is located on Route 302, in Bretton Woods, NH 03575. It provides a special and gratifying vacation for grandparents and parents who long to introduce the great outdoors to kids, but don’t feel prepared to go camping without some support. Do participate in the guided offerings, such as early morning walks to learn about birds and animal tracks. Especially with kids new to hiking, having a guide and other participants to set the pace can make an introduction to this lifelong sport much easier. Rates include breakfast and dinner daily, as well as a full program of free, guided hikes, lectures and access to the AMC’s well kept trails. Up to 120 guests can stay in either a Lodge room with private bath or shared bath; family rooms with a double bed and two twins; or at the Shapleigh Bunkhouse next door, in a dorm with shared facilities, for about half the price. The AMC Hut system is a well-run operation and provides a rare hut-to-hut hiking experience with a decent level of comfort. We highly recommend booking one night at these self-contained, solar and wind-powered outposts where all accommodations are bunk style. You can dine and share compost toilets with the college kids who staff them and hike up and back daily to portage in your meals. 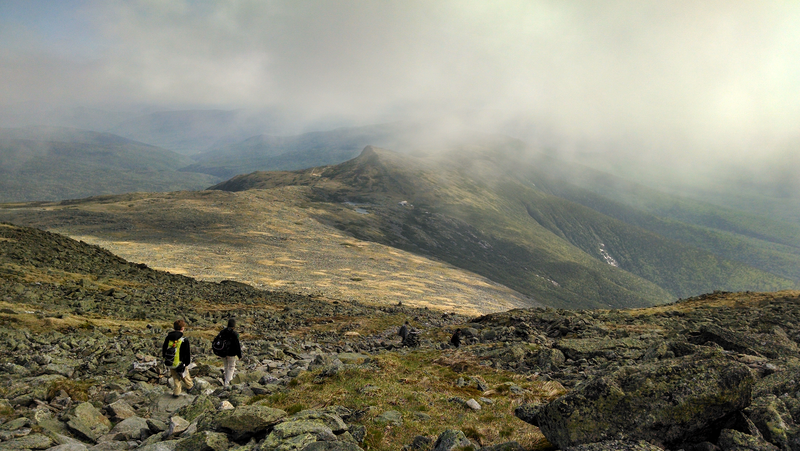 The Highland Center provides hike in access to the Mizpah Hut and a bit farther, to the Zealand Hut. Reservations are required and with significant lead time in the summer months and holiday weeks.